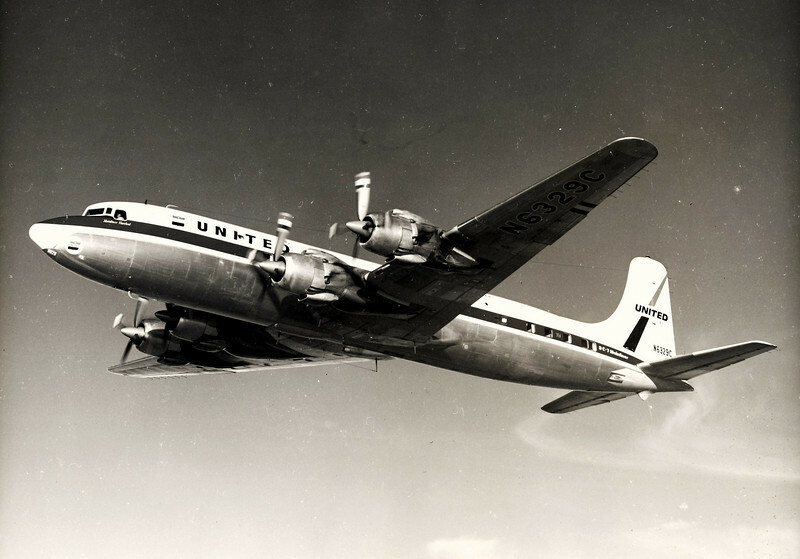 United Air Lines Flight 736, a DC-7 (N6328C), departed with 47 passengers and crew from Los Angeles (LAX) at 7:37 AM. Flight 736 was on a transcontinental flight to New York City (Idlywild) with a planned cruising altitude of 21,000 feet. 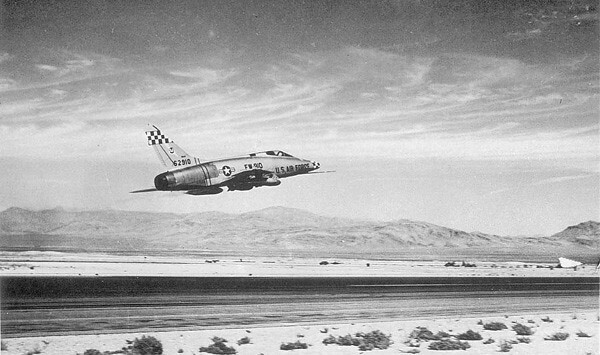 At about 7:45 AM, a US Air Force North American F-100F-5-NA Super Sabre fighter (56-3755) took off from Nellis AFB on an instrument training flight. During the exercise the flight was executing a simulated jet penetration in the area of Las Vegas, NV. 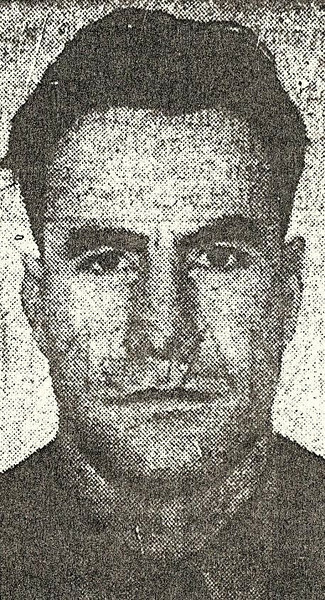 At 8:30 AM, the fighter plane pilot reported that they were descending from 28,000 feet near the KRAM radio station. At the same time, United flight 736 was approaching the Las Vegas VOR. 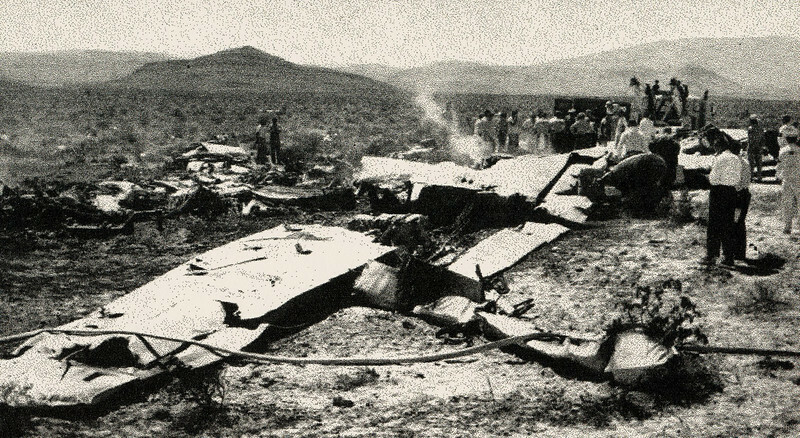 Both aircraft collided head-on at 21,000 feet, nine miles southwest of the Las Vegas VOR station on Victor Airway 8. Initial contact occurred between the leading edge of the DC-7's starboard wing and the leading edge of the F-100's starboard wing. 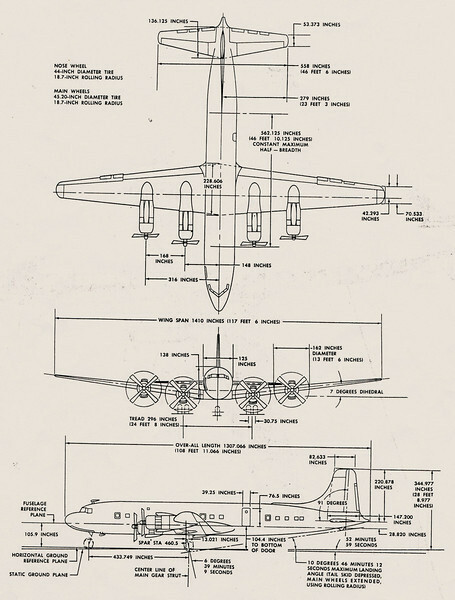 It was determined during the Civil Aeronautics Board (CAB) accident investigation that the DC-7 was flying at about 312 knots on a 023 degree heading and the F-100 at 444 knots on a 145 degree heading. Assuming a small descent angle of the F-100, the closure speed was close to 700 knots. Both planes crashed out of control with the DC-7 entering a steep spiral dive. 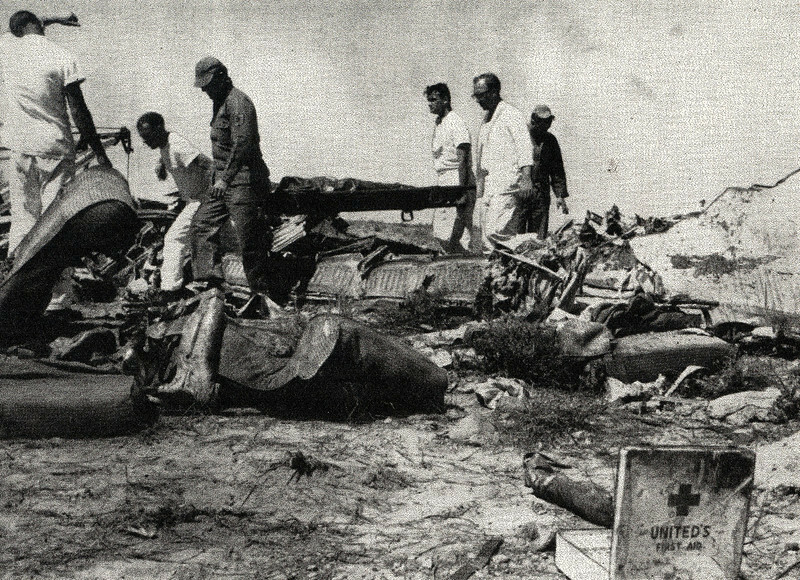 During the dive, three of the DC-7's four radial engines separated prior to impact. 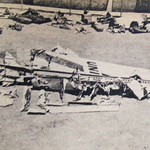 All persons on board both aircraft were killed. 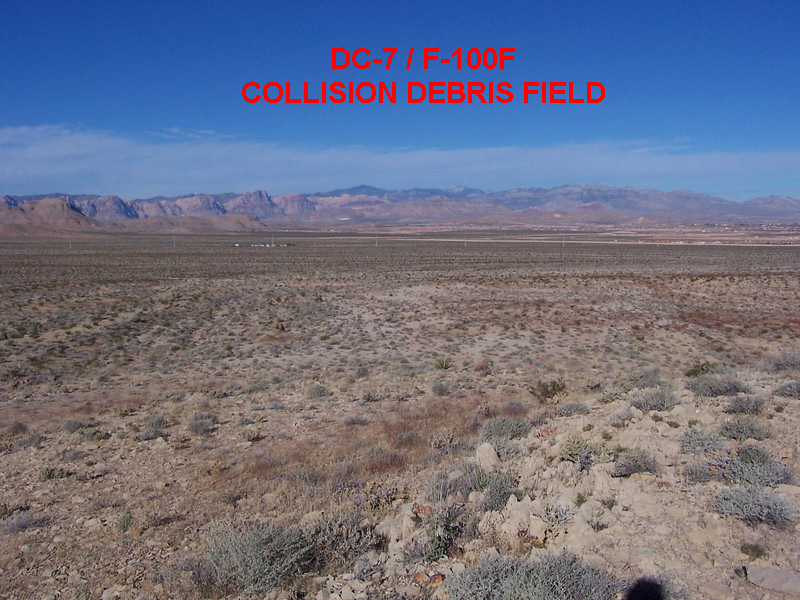 The collision created two aircraft impact sites separated by seven miles, in addition to a large debris field between the two sites. 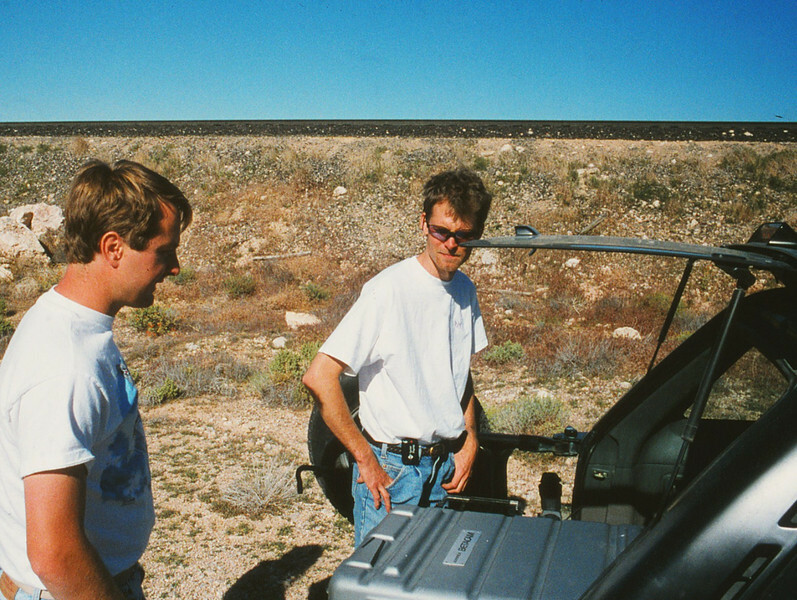 During 1995, after much research and an extensive ground search, the DC-7 engine impact site was located. 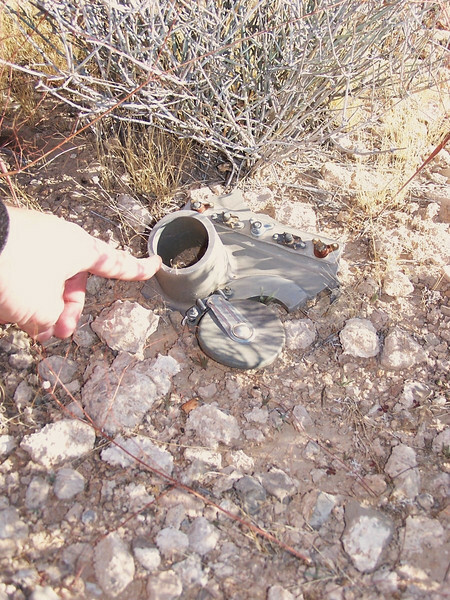 This discovery along with the discovery of the F-100F crash site by Craig Fuller of AAIR allowed the triangulation of the DC-7 main impact site. 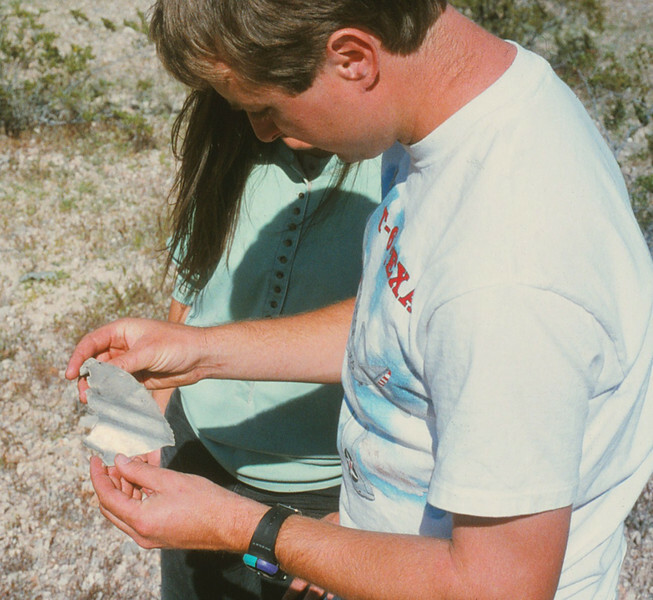 When we first examined the DC-7 impact site, it appeared to be undisturbed with little evidence that an impact even took place. Reviewing old aerial photos, we decided to dig some test pits which revealed that the site (burned impact area) had been covered with a layer of top soil after the initial recovery work had been completed in 1958. The top soil not only concealed the site, but also formed a protective barrier from exposure. In effect it was a time capsule. 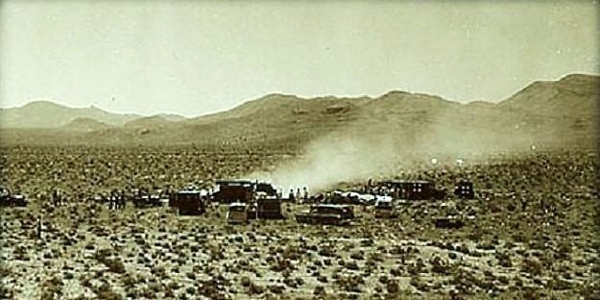 However, with the population of Las Vegas growing, it was inevitable that the DC-7 impact site was in the path of future development. Working with the landowner, we adopted a plan to map, excavate, document, and preserve the wreckage material we could recover. Over the following three years we excavated an area about 40 feet by 30 feet using a series of grids to mark not only where we excavated but also help document where we located items of interest. As a result, we recovered and documented hundreds of historical items during the excavations. Within a few short years the crash site of United Air Lines Flight 736 would be replaced by several commercial buildings and homes. **UPDATE** June 2008, I visited the impact site of UAL Flight 736. A backhoe tractor had excavated a series of utility line trenches in front of the auto-tire center that was under construction. 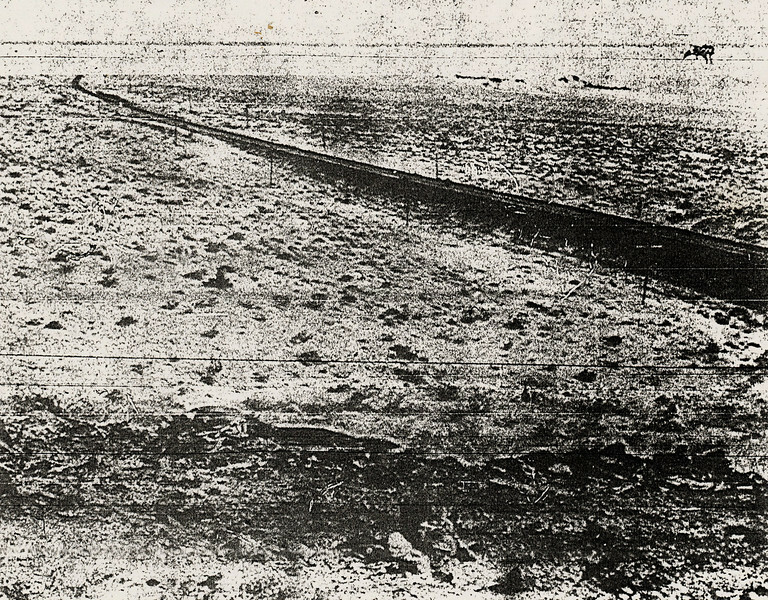 Visible in the freshly cut trench walls were the burned remnants of the DC-7 still covered in the top soil from 1958. I returned the next day and the trenches had been filled in. The Douglas DC-7 was an American transport aircraft built by the Douglas Aircraft Company from 1953 to 1958. It was the last major piston engine powered transport made by Douglas, coming just a few years before the advent of jet aircraft such as the Boeing 707 and Douglas DC-8. 348 were produced: about 40 are still in service. Length: 108 ft. 12 in. Wingspan: 117 ft. 6 in. Height: 28 ft. 9 in. Max takeoff weight: 143,000 lbs. Powerplant: Four (4) Wright R-3350-18EA1 turbo-compound radial piston engines, 3,250 hp. each. The Douglas DC-7 was the fastest production commercial airliner produced. While speed and luxury were it's selling points, On the downside, the DC-7 had poor cockpit visibility. 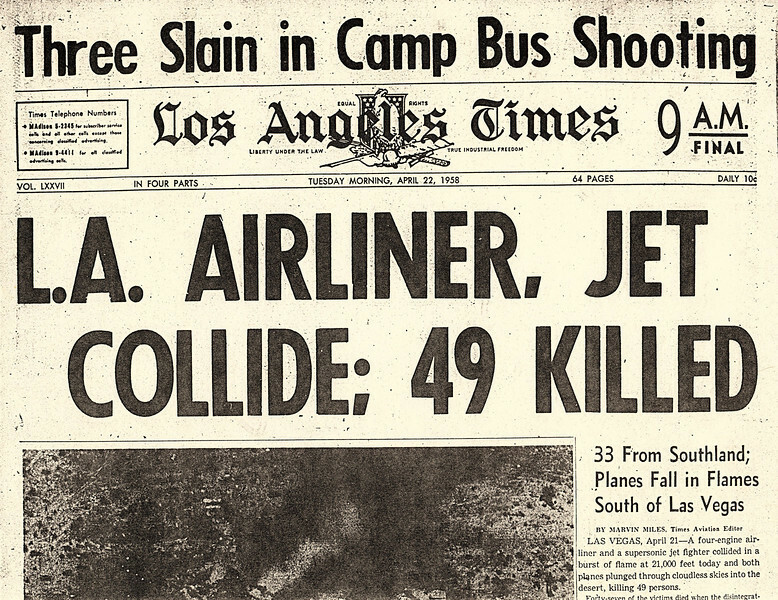 This was a contributing factor in this accident as well as the Grand Canyon mid-air collision of 1956. 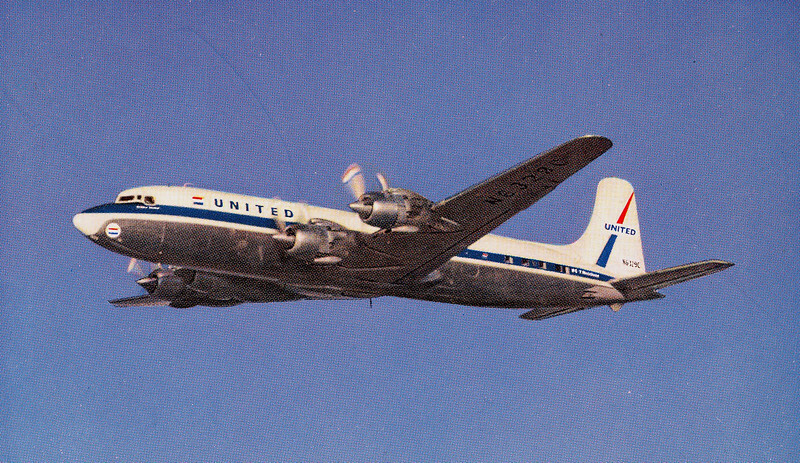 United Air Lines operated fifty-seven Douglas DC-7s during the 1950s and 1960s. 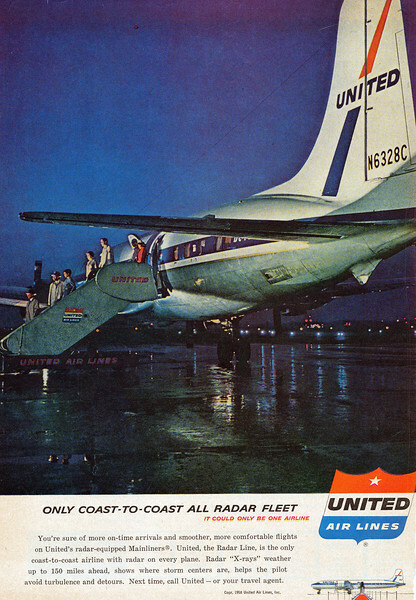 This rare United Air Lines magazine ad from 1958 featured a color photo of N6328C. The ad ran for less than 3 months before it was removed from circulation by the airline immediately after the accident. 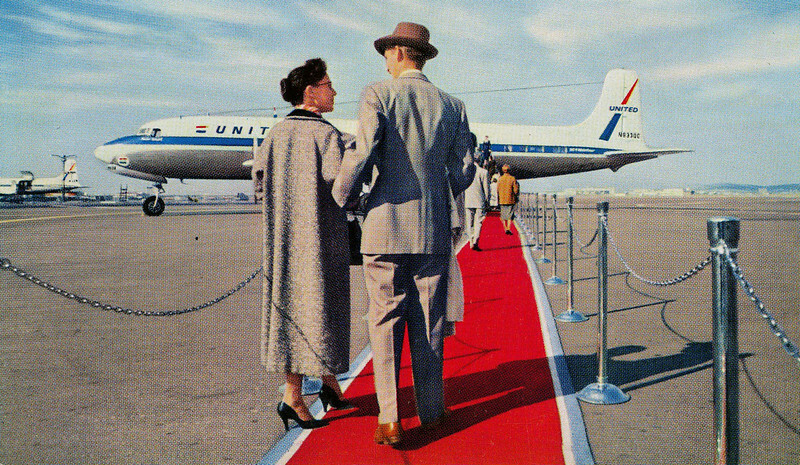 During the 1950's, United Air Lines actually did roll out the red carpet for it's passengers during their promoted "Red Carpet Service". 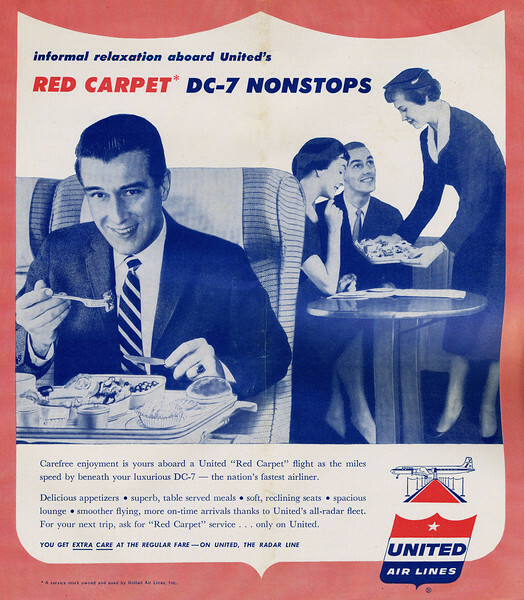 With real gourmet food, reclining seats, and a spacious smoking lounge, there wasn't much not to like about a flight on a United DC-7 Mainliner. 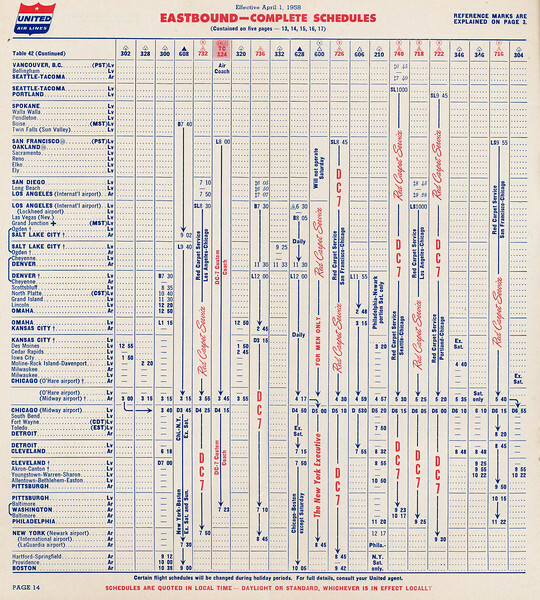 This United Air Lines schedule timetable dated April 1, 1958 would have provided schedule and travel information for passengers booked on UAL's ill-fated Flight 736. This page from the United Air Lines timetable dated April 1, 1958, lists Flight 736 as a coast to coast flight that originated at Los Angeles International Airport with stops in: Denver, Kansas City, Washington D.C., and New York City. 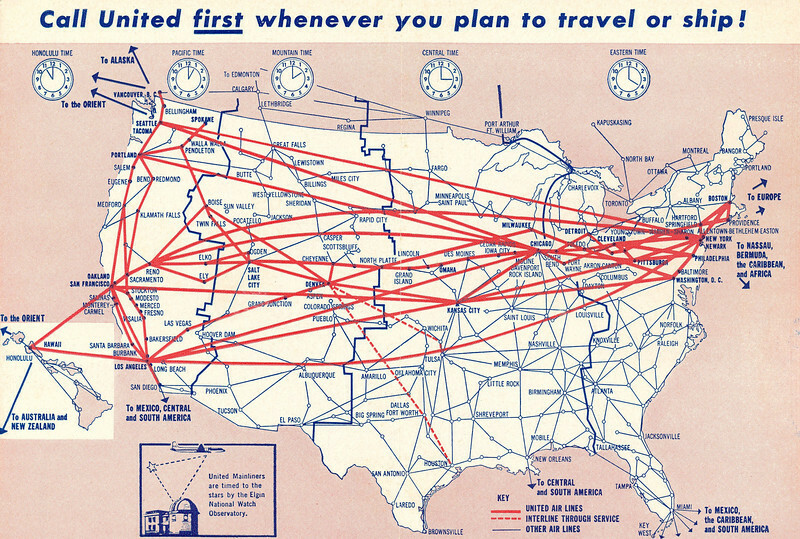 This United Air Lines system route map illustrates the route structure of the airline during April 1958. 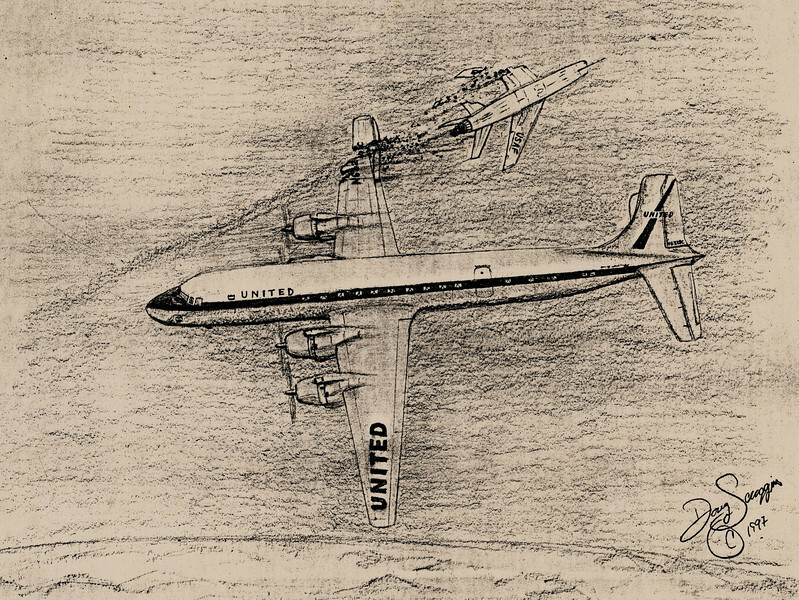 United Air Lines would later go on to be one of the largest global air carriers. The North American F-100 Super Sabre was a jet fighter aircraft that served with the United States Air Force (USAF) from 1954 to 1971 and with the Air National Guard (ANG) until 1979. 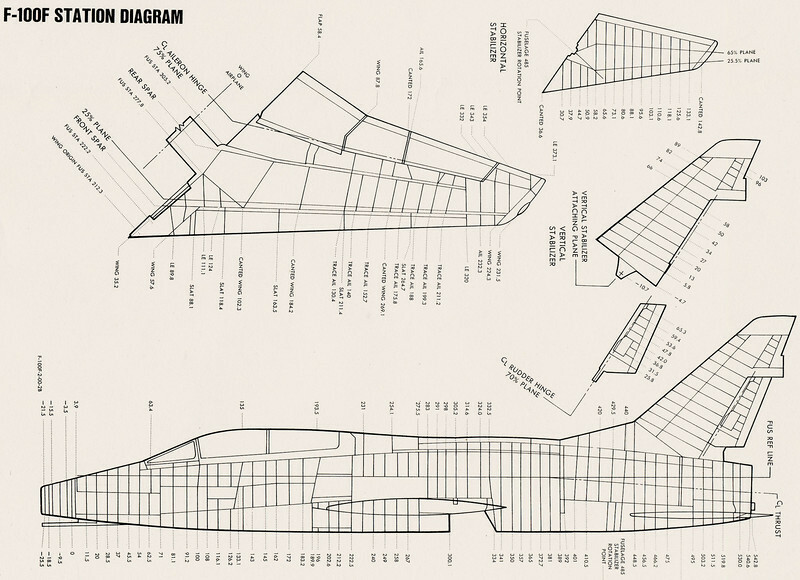 As the first of the "Century Series" collection of USAF jet fighters, it was capable of supersonic speed in level flight, and made extensive use of titanium throughout the aircraft. The F-100F was a two-seat training version. 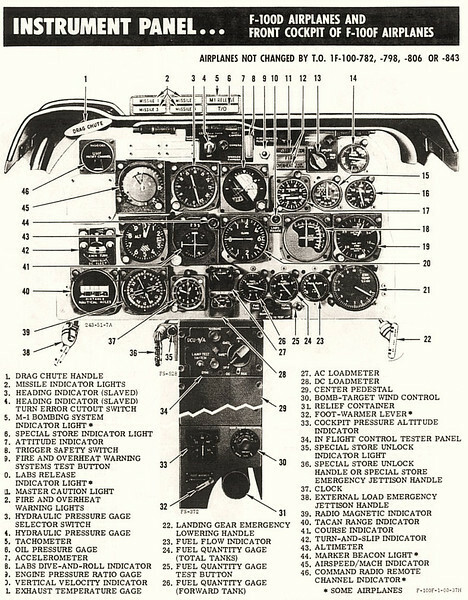 First flight was on March 7, 1957 with 339 aircraft eventually being built. A structural station diagram such as this provides useful information when trying to determine extent of damage in a collision. 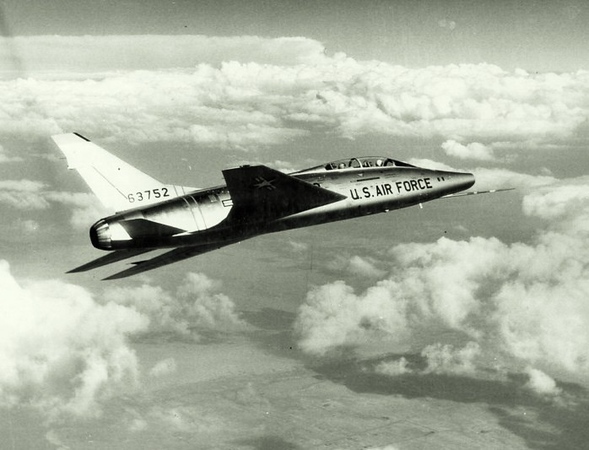 At 7:45 am, about half an hour before the airliner crew reported their position, a U.S. Air Force F-100F-5-NA Super Sabre jet fighter, serial number 56-3755, departed Nellis Air Force Base near Las Vegas on an instrument training flight with two pilots on board. In the front seat of the tandem cockpit was flight instructor and safety pilot Capt. 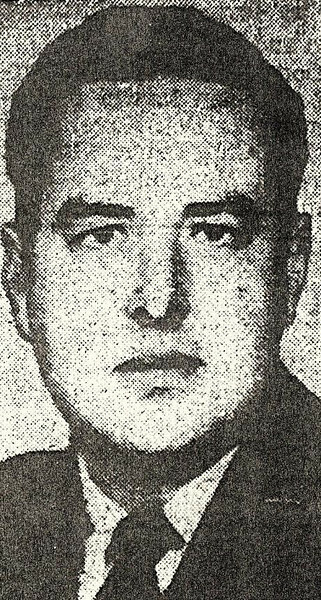 Thomas N. Coryell, 29, and behind him sat his student, 1st Lt. Gerald D. Moran, 24, who as part of his training would spend the flight under a hood that blocked his view outside the aircraft, but allowed him to see his instrument panel. Captain Tom Coryell was a fighter instructor based at Nellis Air Force Base. 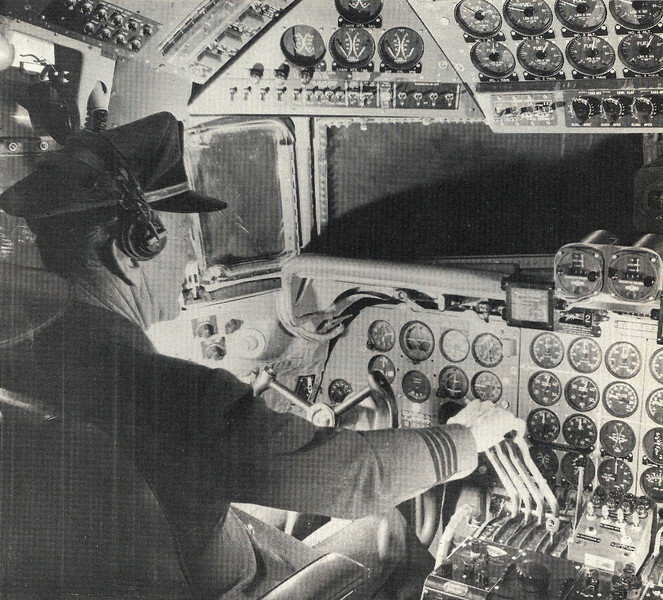 In the front seat, Captain Tom Coryell, the flight instructor would have had a clear view outside and was the first to see the approaching DC-7. Captain Coryell took the controls from 1st. 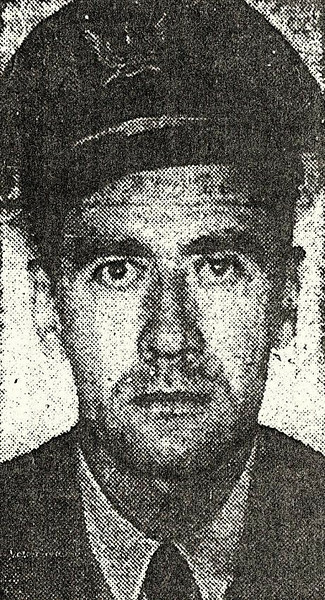 Lt. Jerald Moran and initiated the evasive left banking turn. In the rear seat under the hood was Captain Coryell's student, 1st Lt. Jerald Moran. This instrument panel was his only view from the aircraft. 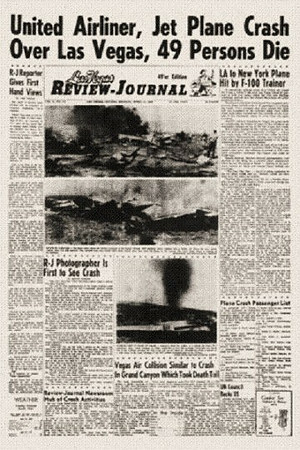 Similar to the 1956 Grand Canyon mid-air collision, the Las Vegas collision also occurred at 21,000 feet on a clear morning. 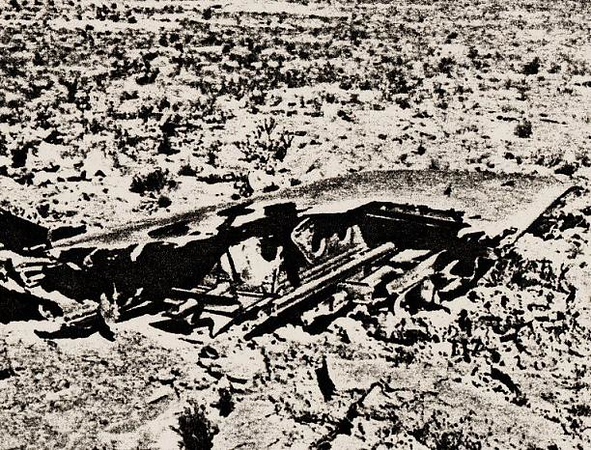 The F-100F impacted a small hillside next to the Union Pacific Railroad tracks leaving nothing more than a crater. One of the pilots of the fighter jet attempted to eject from the aircraft, but ejection was initiated at too low of an altitude and the crewmember died on impact. 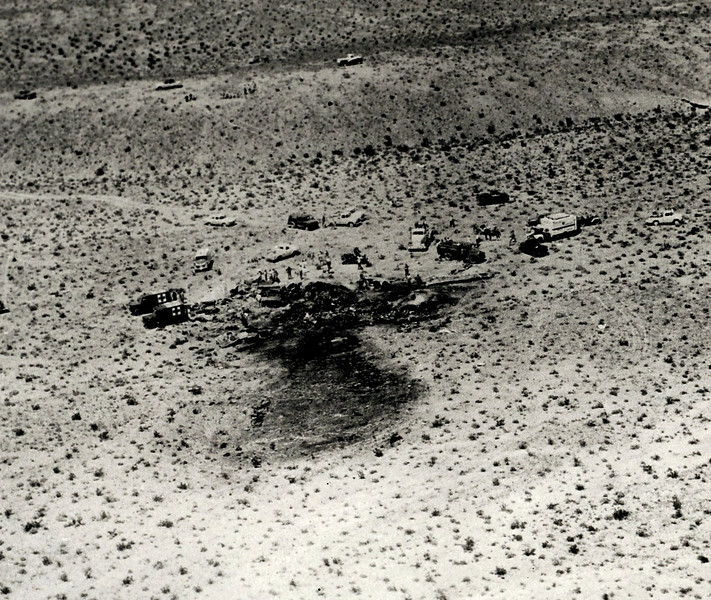 The Douglas DC-7 impacted the flat desert terrain south of Las Vegas with very little if any forward motion. As a result, the main impact site itself was confined to a relatively small area. The emergency response to the collision took only a few minutes, but the fire could not be contained and burned for several hours. 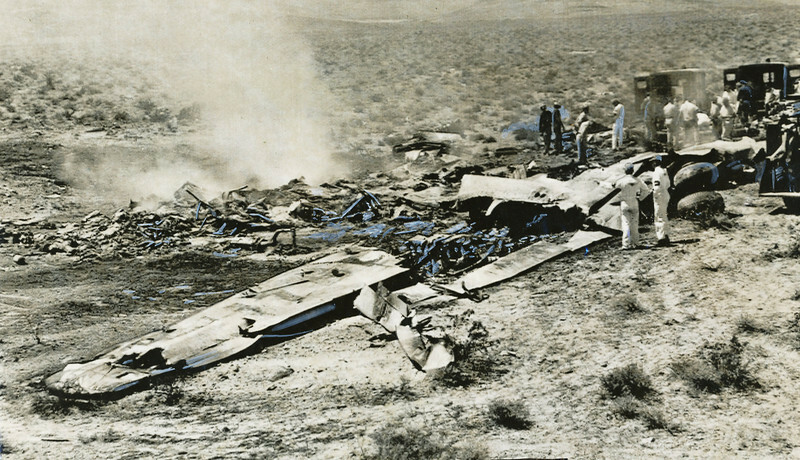 Only the DC-7's left wing and tail section survived the intense post crash fire. Several witnesses spotted the DC-7 falling while three engines broke from their mounts and fell a quarter mile away from the main impact site. 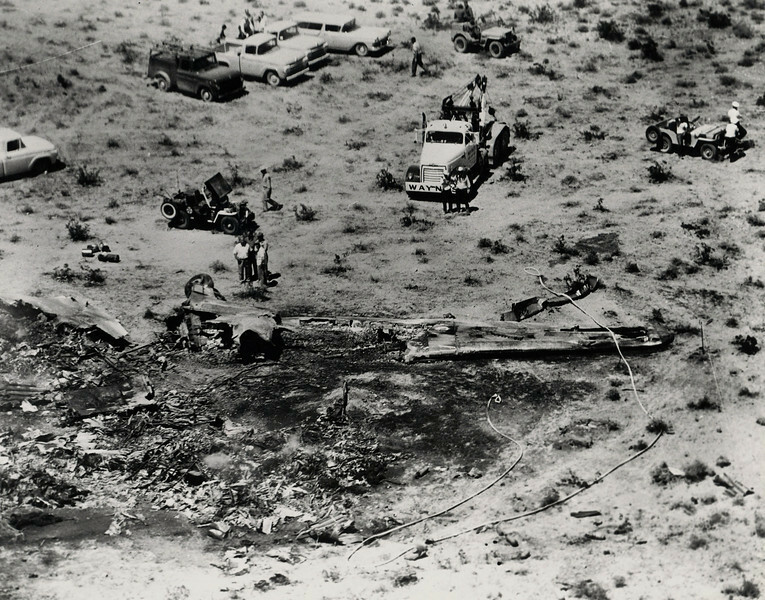 Another view of the DC-7 crash site looking south. 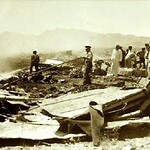 Recovery teams examine the smouldering debris of the fragmented passenger cabin. Recovery teams remove a victim. 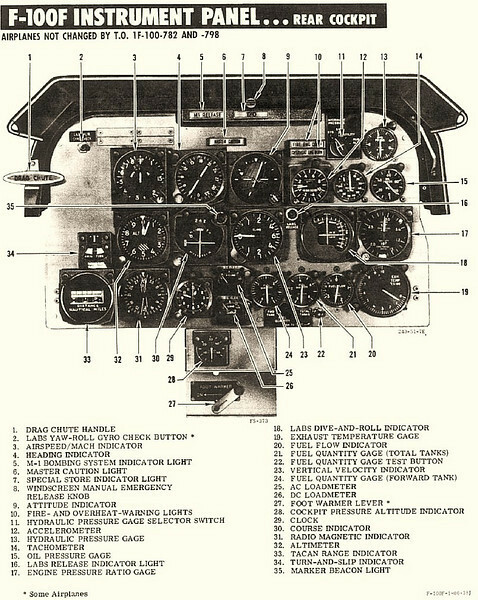 Passenger seats as well as an opened first aid kit from the aircraft can be seen in the foreground. After the Civil Aeronautics Board on-site investigation, the large fragments were taken to a hangar at Nellis Air Force Base for further analysis. 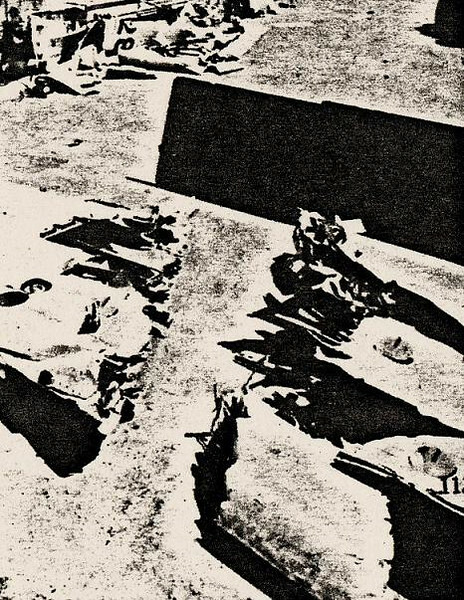 United Air Lines was faced with a clean-up operation that resulted in bulldozers and grading equipment to be brought in and bury the impact site to conceal it from curiosity seekers. 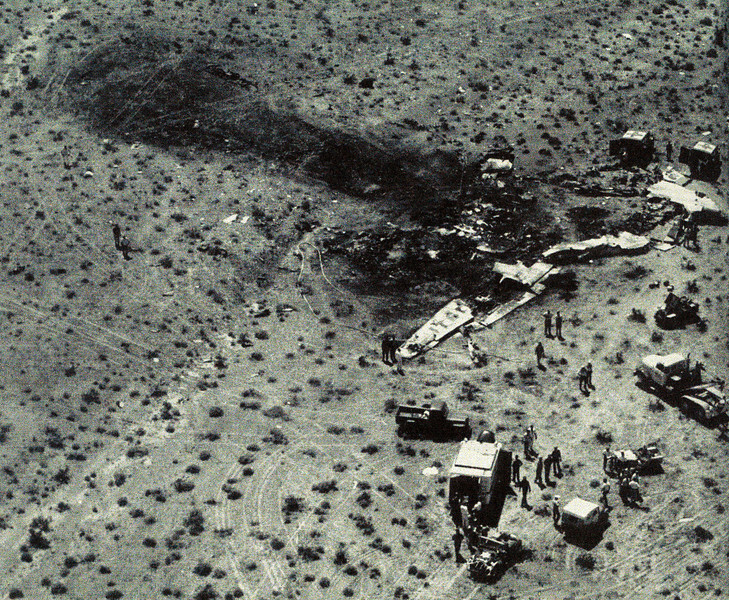 Wreckage of both aircraft were removed from the desert and taken to a secured fenced yard on Nellis Air Force Base. 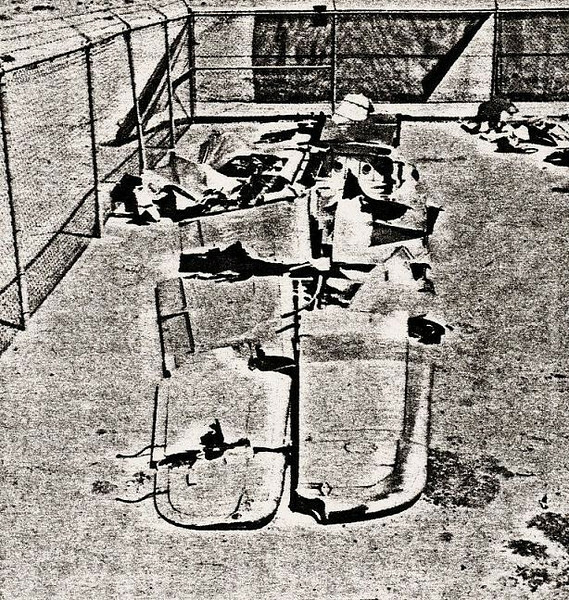 Pictured is the recovered right wing from the F-100F. 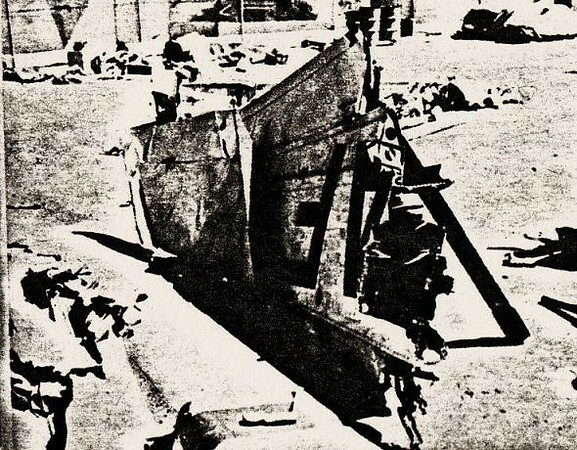 The severed starboard wing of the F-100F was located not far away from the DC-7's starboard wingtip. 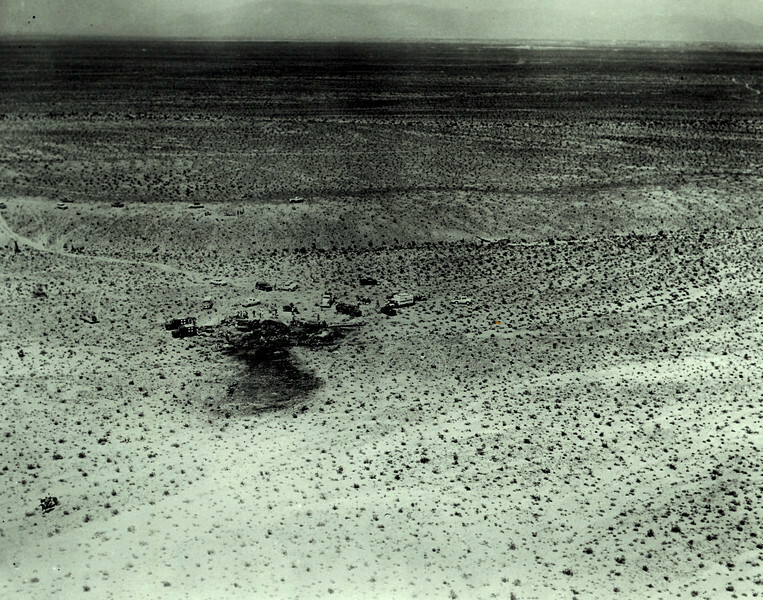 The DC-7's severed starboard wing was located in the open desert between the impact sites of the airliner and military jet. This photo illustrates the clean separation cut made by the F-100F's wing through the DC-7's right wing. 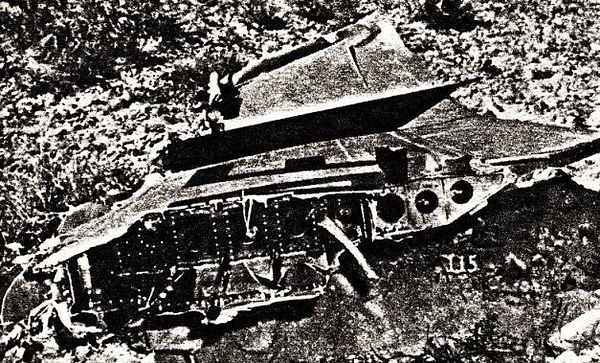 The severed right wing of the United DC-7 illustrates the damage inflicted by the collision. The collision rendered the DC-7 uncontrollable. The DC-7's vertical stabilizer and rudder in the storage yard at Nellis Air Force Base. The local Las Vegas Review Journal's headlines the following day. The accident made headlines from coast to coast and around the world. 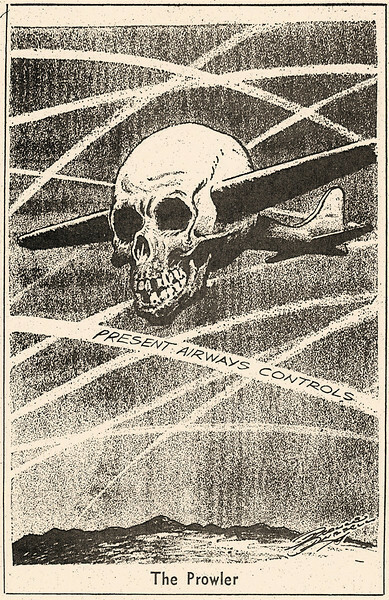 This editorial cartoon "The Prowler" published shortly after the Las Vegas collision illustrates the public's growning concern for the congested airspace and the lack of positive radar control. 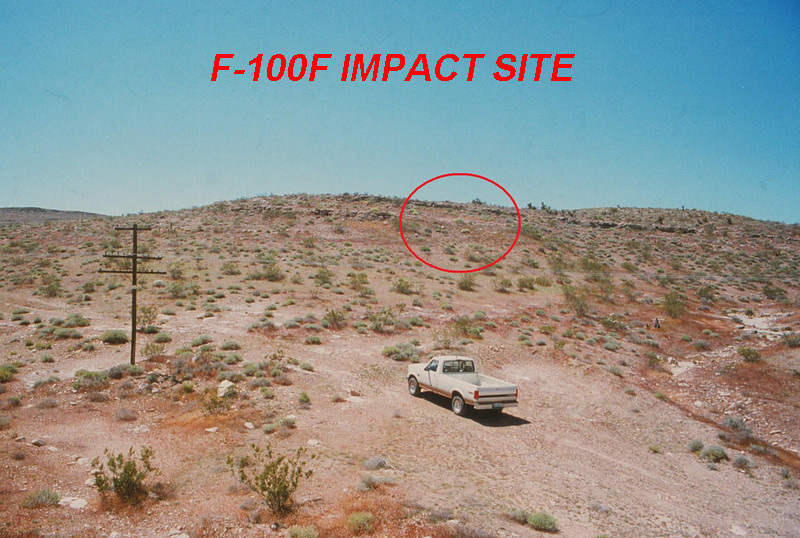 During 1995, I made my first visit to the impact site of the F-100F which lies about seven miles south of the DC-7 main impact site. 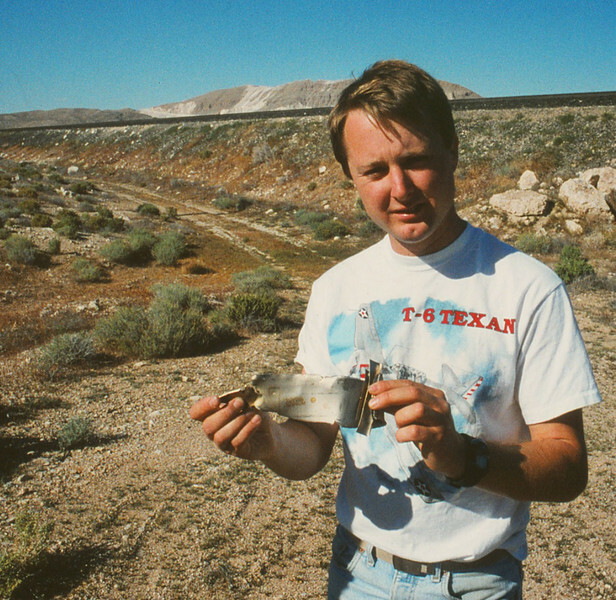 Craig Fuller of AAIR holds a titanium fragment from the F-100F. 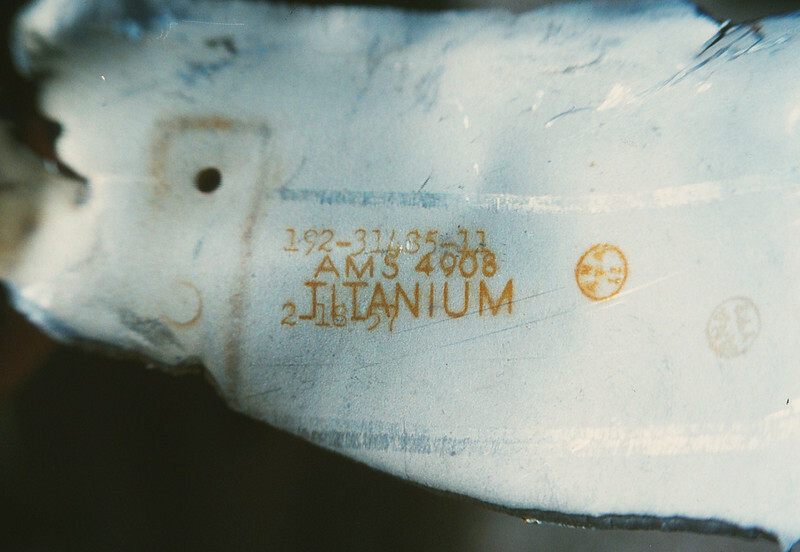 The fragment was marked "TITANIUM" and included a part numbers, date stamp, and manufacturer stamp from North American Aircraft Co.
Craig Fuller of AAIR and Doug Scroggins of Lost Birds Aviation Archaeology. Craig examins another fragment at the F-100F site. Not all of the wreckage from the collision was recovered by CAB investigators. 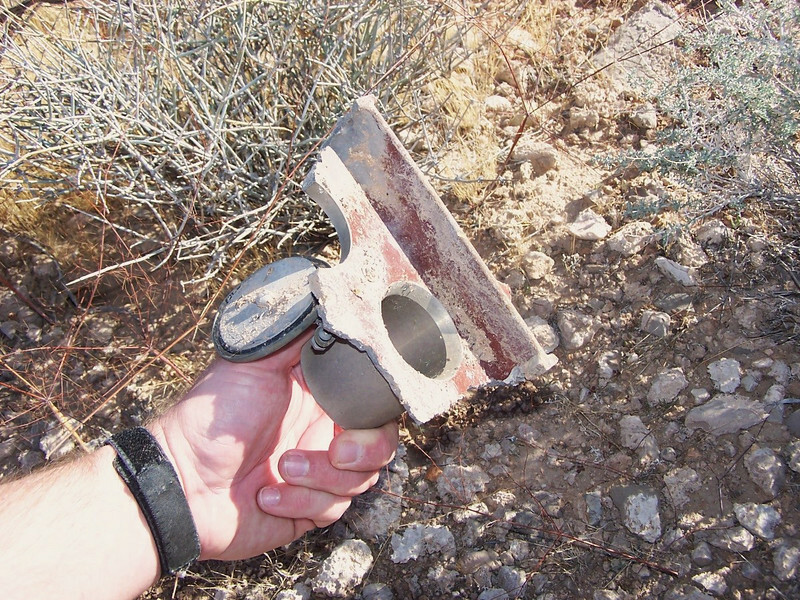 During my search of the debris field in December 2005, it took about an hour of hiking a quarter mile search grid to find this fragment.